Shipman Park in Kea‘au is known for people of all ages using the fields to play soccer. 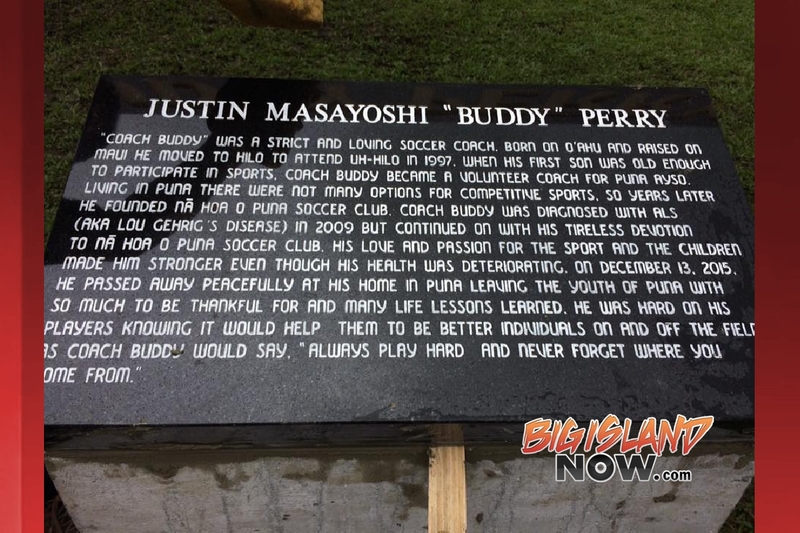 Last year the fields at the park were named the “Buddy Perry Soccer Fields” in honor of the late Justin Masayoshi “Buddy” Perry, after members of the Nā Hoa O Puna Soccer Team petitioned the county to name the fields after Coach Buddy. 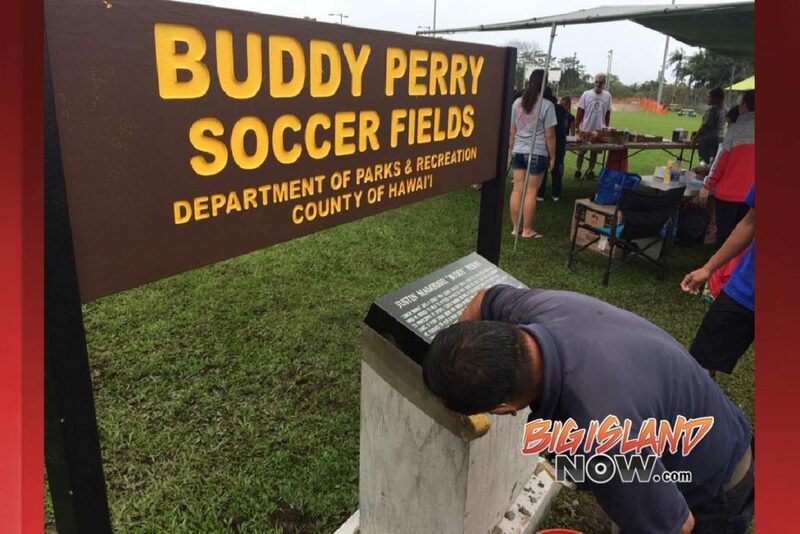 On Saturday, March 3, 2018, while the Nā Hoa O Puna U14 soccer team was playing a game, county workers installed a new monument underneath the original sign. “Coach Buddy” was a strict and loving soccer coach born on O‘ahu and raised on Maui. He moved to Hilo to attend UH-Hilo in 1997. When his first son was old enough to participate in sports, Coach Buddy became a volunteer coach for Puna AYSO. Living in Puna there were not many options for competitive sports. So years later he Founded Nā Hoa O Puna Soccer Club. Coach Buddy was diagnosed with ALS (AKA Lou Gehrig’s Disease) in 2009 but continued on with his tireless devotion to Nā Hoa O Puna Soccer Club. His love and passion for the sport and the children made him stronger even though his health was deteriorating. On Decemeber 13, 2015, he passed away peacefully at his home in Puna Leaving the youth of Puna with so much to be thankful for and many life lessons learned.